Sitting in the balcony of Pioneer Chapel, 284 men heard the echoes of tradition Saturday as Wabash College held its annual “Ringing In” ceremony. 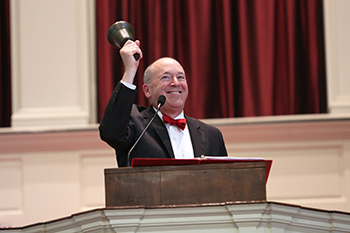 Using the hand bell that o nce belonged to Wabash’s first educator, Caleb Mills, President Gregory D. Hess rang in the largest incoming class since 2011. Associate Dean for Enrollment and Director of Admissions Chip Timmons ’96 and his staff have worked diligently to increase the size of the College’s incoming class, but as he looked up at the balcony Saturday and remembered what this day was like for him as a freshman, he wasn’t thinking about the numbers. 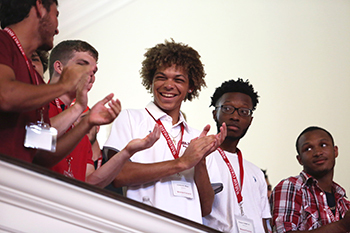 As he greeted the Class of 2022 from the stage Saturday, Timmons didn’t speak to them just as new students – he welcomed them into his Wabash family. The students joining the Wabash family come from 21 states and 10 countries. There are 21 freshmen who held the title of president of a class, club, or organization in high school, 14 Eagle Scouts, and three Special Olympics coaches, among many other accomplishments. Rob Shook ’83, president of the National Association of Wabash Men, echoed Timmons’ sentiments of brotherhood when he addressed the class Saturday. Also included in the family are the Wabash faculty and staff, said Dean of Students Mike Raters ’85. They will challenge students, but their goal is to empower them. Before reaching for the Caleb Mills bell, President Hess asked the 284 men sitting in the balcony to stand and introduce themselves to their classmates. “These are the men who will become some of your greatest teachers, life-long friends, business partners, the best men at your weddings, and your strength in times of joy and need.